Wow, it was April 2006 we made the last entry to this blog! No way to ‘catch up’ 10 months of no posts. Life has certainly moved on for us, but not this blog. Okay, so Christmas 2006. We purchased (at seriously reduced price) a new artificial Christmas tree. We already have a huge 6 foot tree that completely takes up either the upstairs or downstairs cupola if that is where we place it. Or takes up the whole front of the living room if that is where we place it. It certainly holds all the decades of Christmas ornaments back to when the children were, in fact, children. Now, they are grown with children of their own. It’s kind of sad in a nostalgic kind of way to put up the big tree with all the years of ornaments unless the kids and grandkids are going to come for Christmas visit. For now they are scattered about, and sometimes they can do the travel, sometimes not. I wanted instead a smaller more compact tree that I could tuck in a corner and I’m quite satisfied with the size of this smaller tree. Our Christmas gift to ourselves this year. A nice double recliner loveseat. 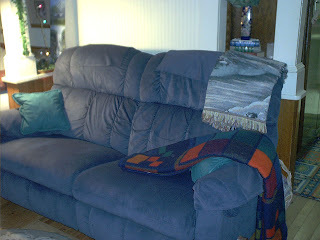 We have for several years now been discussing getting either couch or loveseat that has dual recliners. It was still years in the future for us as a purchase. When we were out and about taking in Christmas bazaars and such like, we came across a garage sale that we almost didn’t stop at and found this great dual recliner at a price too good to pass on. Nope, not telling, but we knew we would not likely come across such an affordable price for this kind of piece of furniture again and it was in such good, cared for shape. We left, both yearning and wishing we hadn’t committed to dental work and $$ cost to us. Somehow we managed to talk ourselves into believing we could tighten the budget belt, squeezing hard, eat beans and rice, and doing so could manage to pay the dentist $$ and treat ourselves to this Christmas present. Now, it’s February and we are recovering but recliner is paid for and so is the dentist $$. We bought this house in Nov 2002. Now in 2006, I have an acquisition of photos that show changes in the yard. Photos below are from 2006. 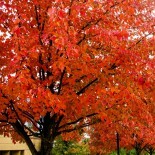 I will need to backtrack to add slideshow photos from previous years. We bought this house in Nov 2002. In Spring 2003, began work in the yard, very modest beginning, mostly adding a few annuals, some containers, cutting back rhodies and some other overgrown mature specimens. For vegetable garden, I used split-bag topsoil, planting seeds directly into the split bags. In Spring 2004, work in earnest began to shape up the yard, retaining the flavor of the original owners vision. Also did not want to take out, prune, remove plants until we knew what they were – using that axiom to wait a year and see what’s what. In Spring 2005, more work in earnest, serious pruning, removing, and began actually rearranging, creating and starting to claim yard more to our vision, rather than preserving integrity of original owners vision. Learned original owners stopped living in the house, using on occasional weekends, so yard upkeep had lost it’s shaping over the years. In Spring 2006, we are now engaged in claiming the yard as our own. We have been one-income family since May 2003 when I left my career employment. It has put a serious damper on spending so working the yard has been on extremely frugal budget. Patience and bit by bit, plant by plant, back-breaking labor, we are very gradually getting somewhere towards our yet unrealized vision for the yard and house. Original house, 1886, saltbox structure, wood built on piers — third house from the right in the photo. 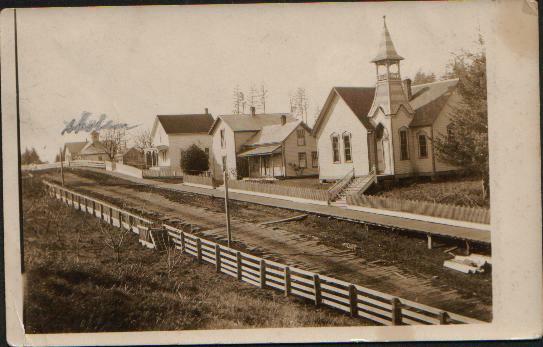 Church on right, preacher’s house next to church, and what was then the original house (with white picket fence). 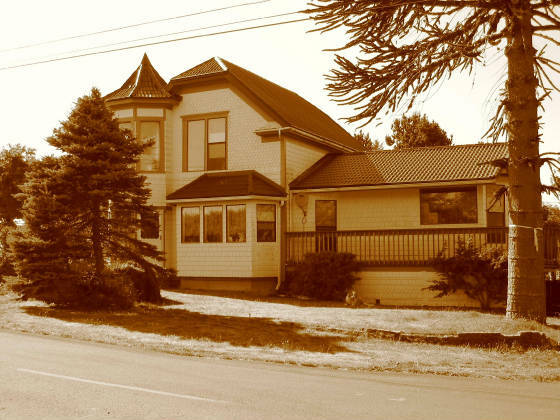 I’ve heard different accounts as to when the house was built – 1886, 1887, 1892. Whichever of those years it was built in, it is still standing sturdy over a century later and that’s something! 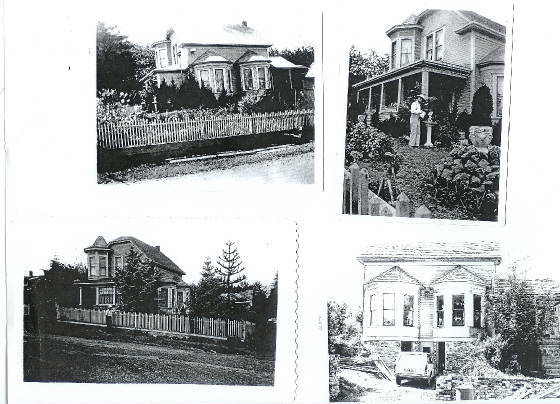 The first modifications to the house in early 1900’s. Added was the second story level cupola, and the two large bay windows on side of the house. The porch remains, and the white picket fence remains. House originally built by the Miller’s; her daughter married Harry Bochau and they became the owners of the house. Harry Bochau was a barge builder by trade and added the architectual details of the second story cupola and the two bay windows on the side of the house. Mrs. Bochau was pleased with the additions and called her house a chateau. It came to be known in the community as the Bochau Chateau. Lower left hand photo and you can see the baby Monkey Puzzle Tree that was planted then. As this is a community on Willapa Bay, it was more so then that all the communities on the bay commerced by boat, ferry and ships. When the ships would sail into this community, Mrs. Bochau would go down to meet and greet the ship and boat captains, invite them to dinner, while others in the community would do likewise for the rest of the crew. One ship captain had monkey puzzle trees from Chile, South America, on his ship and gifted one of the trees to Mrs. Bochau (so I’m told the story goes). When we bought the house, the monkey puzzle tree she planted was still there and 92 yrs old. But our saga of the monkey puzzle tree is for another blog entry and I’ll tell that story another time. The house as it is today after several more modifications and additions by the 3 owners who followed the Bochau’s. 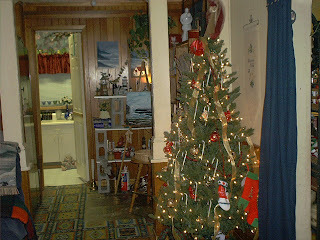 This is the house in 2003, not quite one year after we bought it. Identifying plus elements and problem issues when considering buying this house. We began our house-hunting in Aug 2002. – quiet neighborhood, quiet community, not even one store in the whole village! – berber carpet on main floor rooms is beyond salvaging, so badly stained, unlikely can get cleaned = deal w/ flooring. – renovations done in 1970’s give seriously dated and tired look = stairs, upstairs flooring like glue down carpeting – 70’s restaraunt era; brown shag on stairs -yuck! – heating; primary heat is a newly installed wood-burning furnace under the house w/ chimney that screams at me’unsafe’. secondary heating; registers installed in each room, inadequate in some rooms to heat the space. – decking on which addition has been builtwill need immediate attention, peeling rubber cement exposes wood to Pacific NW rains. – back porch – enclosed and rusticly ‘finished’ also unwelcome and serves as main entrance to the house due to the impractical front entrance planning. Generally speaking, there are about even number of drawbacks as there are positives that make this house worth considering. Biggest drawback is that house would benefit from renovations and improvements w/ cost outlay – not likely in our budget. Thus, after carefully considering if I could live in the house ‘as is’ for perhaps years until we could get to renovations/improvements, I honestly wasn’t sure and thought we should continue to keep looking. My dear husband is more of a handyman than he is into renovations or improvements, so unlikely we could knowledgeably take on too many diy projects. My husband became instantly enchanted with the house, and while I was also ‘enchanted’ by what I could see in my mind as what the house might look like ‘someday’, I was concerned about what it looks like present day and our capability w/ diy improvements. The diy upgrades and improvements made to the house look like diy .. sometimes gone wrong or unfinished. We discussed, and discussed, while I fed my fears and my husband tried to reassure my every concern. We decided to buy the house, inspections came back approved for wiring, plumbing, septic, structure and whatever else gets inspected in mortgage arrangements. 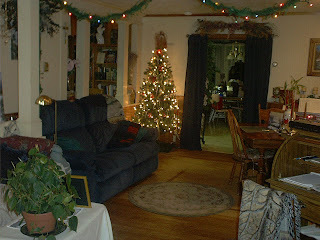 Nov 2002 is when we moved into the house. If we had the resources to take care of some of the improvement projects before moving in, might have been a better way to go, but that is why it is an adventure and now in 2006, we both love living in this house! About a year after we bought the house, we made both upstairs rooms into bedrooms. My sister came on a visit from Utah and slept upstairs in the bedroom where in the photo below shows a red circle around the window to that room. Yeah, yeah yeah ….. and I soon forgot about it. Yesterday at work I was interviewing a woman – I’ll call her Dot – who was a pre-teen in the late 1960’s and knew the elderly lady, June Bochau, who’d lived most of her life in this house. Born in 1877, June Bochau died in 1970 at the age of 93 and was still living in the house with her son. Dot remembered for me how she used to brush the old lady’s hair, telling me that she remembered mostly how long it was. Dot then told me that later on, when she was older, she was back in the house helping another owner do some clean up. She said that June’s presence was still in the home even though she had died a few years earlier and that June’s presence was most strongly felt in the bedroom where the window is circled below. I then remembered my sister’s story. I’m sitting in that room as I write this since it is now the room where my Sweetie and I spend probably half of every day while on our computers. I came home last night thinking about June Bochau, a character about whom I’ve heard many stories in the 3 1/2 years we’ve lived here. My Sweetie is not here right now but down the road some 40 miles this week in Long Beach with her mother so I’m home alone. I moved her computer chair with it’s arm rests and high back out from her desk and turned it to face me last night. Every so often I’d turn and look at that chair which is the only place left in her former bedroom where June Bochau could sit down right now. No, the chair did not move and although the window is open, the curtains did not rustle. Nevertheless, I think about Dot who told me that she got chills up and down her spine when I told her what house we had purchased and were now living in. 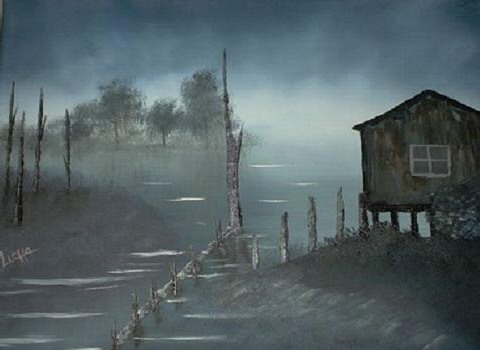 I think about my sister who is not prone to telling ghost stories …. I look at that empty chair, look out the door to the upper tower room where I can see above the houses in the immediate nearbye streets … and think some more about June Bochau. This is the room behind that window in the other picture. That’s me at my computer and immediately to my left is my clothes closet. My Sweetie’s computer is separated from mine by that waist-high cabinet to my immediate right. Sweetie’s computer module is in the corner and the window looking out would be to her right if this were a panoramic view. In the bottom right corner, her desk chair with a red sweater draped over the back sits empty. I turn and look at it and just smile. did you have to use brown shag on the wood staircase? tearing off the brown shag carpet reveals beadboard – what were they thinking! Admit it, we’ve probably got close to the worse staircase project restoration, right? peeking under the brown shag reveals wood stairs and a jillion nails holding all that brown shag in place. Arghh, groan, huge project just ahead. Now to the floors in the two rooms on main level (living and dining room). We think your use of expensive wall to wall berber carpeting was probably a good idea, but when you let other family live in the house in your absence, they must have repaired motorcycles or some such kind of thing in the two main rooms. I never could quite understand how such great carpeting could get so badly soiled and stained, that it was beyond salvage. So we finally took up all the carpeting and now I understand why you chose to do carpet overlay to the unfinished wood floor project we found beneath ….. why did you leave the wood floors in the living and dining room unfinished? Now what do we do once we took up the spoiled carpeting and have this patchwork project confronting us? Okay, we’re taking suggestions. Essentially, once upon a time, very large persian carpets adorned the two rooms, and someone came along later, we guess, to lay wood flooring ‘around the persian carpet area rugs‘ — ??? Why go to the trouble of laying out a beautiful wood floor and not do it completely? Sigh, okay so we’ve thought of a few ideas and would love to take more suggestions. We’d prefer to keep the existing wood flooring cause we like the look of what’s already down, so what do we do to compliment the existing flooring to fill up two very, very large nailed down particle board rectangles in the middle of each room where persian carpets once laid? Oh yes, please do comment, we’d love to hear about it …. believe me, my Sweetie and I have had more than a few comments between us, and now we have to ‘move on’ to more constructive ideas .. ha! Overcoming the ugly – blech. Mind you, we live in a fishing village with homes that range from deserted passed down thru the generations grandparents homesteads to high-end ‘million dollar view of the bay’ homes. Our century old house is located in the ‘town’ part of this peninsula while the newer, designer homes dot the bay in developer’s dreams of closed gate communities. They continue to dream for now, but as our little paradise gets itself found, could be we would lose the unique identity of this ‘back in time’ village. Our house then is located amongst other homes on our streets with a mix of ‘how sweet’ to too bad they don’t tear that place down to abandoned and overgrown and lost to the blackberry growth which almost covers the house. 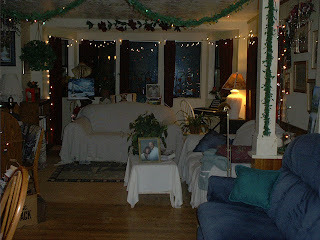 So having set the stage, now can begin to show the ‘ugly’ of our house. Starting with the propane tank. PO converted the hot water and kitchen stove to propane – good idea! However, setting up the propane tank and pipes gives the side of the house a full on view of the propane tank – guess it’s our permanent ornament. Mind you, it’s located right on the street side of the house, not at all hidden away in some less visible corner of the property, so it’s the first thing you see turning the corner at the intersection, and most folks visiting us park alongside that side of the street – Hello Propane Tank! But hey, at least we upgraded from the old, ugly propane tank that was here when we bought the house to a shiny new propane tank! Oh, hmmm, there’s a story to my Sweetie’s plans to sell the old propane tank and offset costs. For a while there we had two yard ornaments; the old tank and the new tank, while my Sweetie tried to figure out how he was going to transport the old tank even if he did find someone who wanted to buy it. NOT! I’m a patient wife, and amusingly wait for some of Sweetie’s ideas to reach fruition until the amusing aspect wears off and with this idea of his, the amusement wore off fairly quickly. 2003 and we were having family come for Thanksgiving and I was hostessing his office Christmas party that year so I was really – Really not wanting family and guests to have the delightful first view of the two propane tanks, the old one and the new one, while parking their cars. Much as I was lauging off the ‘yard ornament’, it just flat out makes a ‘statement’ that I just wasn’t quite ready of willing to identify with …. Sweetie finally agreed to have the propane company take the old tank off our hands … safely … much to my relief. Bye bye to old propane tank!